Newton City Hall is located at 1000 Commonwealth Avenue, Newton Centre, MA 02459; phone: 617-796-1000. Photo: Silver Lake Cordage Company, 308 Nevada Street, Newton, Historic American Engineering Survey [HAER MA-33], Jet Lowe, photographer, 1982, memory.loc.gov, accessed January, 2011. 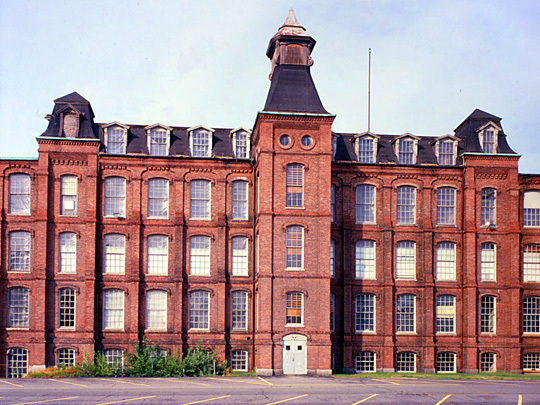 Silver Lake Cordage Company (photo): One of the most architecturally impressive factories in the immediate Boston area is the Victorian cordage factory built about 1866 for the company. The original four-story brick mill building still stands, now the mansard roof center block of the complex which was expanded to the north about 1880 and to the south after 1907. After the company moved to Georgia in 1928, the plant was taken over by the National Packaging Machinery Company, a leading manufacturer of box and carton-forming machinery. — Peter Stott, HAER, 1984. The first permanent settlement of the area which is now Newton occurred by 1639 when the first farm was established near the Brighton (Boston) line. The first families came one by one, however, rather than in groups, and the growth of the town was slow. When the first church was formed in 1660, there were reportedly only 20 families. The pattern of settlement was one of dispersed farmsteads, initially in the eastern part of the town. Newton Corner, Newton Centre and Chestnut Hill were the earliest areas to be settled. Although the first European settlement of Newton did not occur until the late 1630s, native trails may have been adopted by European colonists as cartways by the early part of the decade. The earliest was probably the Dedham Road (from the Watertown ford to Dedham via Centre and Dedham streets), over which Watertown residents moved on their way to farms in the Dedham Grant by 1636. Both the "Sherborn Road" (Florence-Jackson-Clark-Woodward-Beacon-Washington streets) and the "Natick Path" (Washington Street) crossed the Charles River at the ford at Lower Falls. Though the dates of their laying are still unclear, both appear to have been in use by the end of the 3rd quarter of the 17th century. As these roads improved, farmsteads were developed along them, and along connecting routes. By the end of the 17th century, settlement had spread throughout the town, and many farms were located in outlying areas. The Auburndale area was first settled in the 1670s; Waban, in the 1680s; and Oak Hill, in the 1690s. Despite this spread, however, the majority of settlement is found in the organization of Newton's two schools in 1701 at the Centre and at Oak Hill. The schoolmaster was to employ 2/3rds of his time at the Centre school and the remaining 1/3rd at Oak Hill. The industrial development period (1774-1834) saw increasing dispersion of settlement across Newton, with the simultaneous development of 3 well-defined villages: at the Charles River mill locations of Upper and Lower Falls, and at Newton Corner. Although the civic center of the town remained at the Centre, further emphasized by the establishment of the Theological Institution in 1826, commercial activities had begun to shift to the Washington Street corridor — even before the coming of the railroad. Although the early 19th century industrial development of Upper and Lower falls in large part determined the character of those villages, it was the arrival of the Boston and Worcester Railroad in 1834 that made the most profound changes to the growth of the city and its settlement patterns. In the 51 years encompassed by this early suburban period (1834-1885), Newton grew from a town of 2,500 to a city of nearly 20,000 residents. Two major transportation improvements defined the development of Newton during the late suburban period (1886-1907). First, in 1886, was the improvement of the old Charles River Railroad and its extension, as the Boston & Albany's Highland Branch, to Riverside; and the second was the introduction of the electric streetcar, or trolley, beginning in 1889. The automobile, like the streetcar before it, brought a substantial readjustment to Newton's growth pattern. Areas that had previously been neglected or only recently become accessible saw the greatest increase in population. Oak Hill and Waban saw some of the most significant increase, though substantial infill housing took place in all parts of the city. One result was the 1929 relocation of city hall to a more central location on Walnut Street at Commonwealth Avenue. As in many suburban Boston communities, Newton's boom period occurred in the late 1920s. Population grew by nearly 42 percent between 1920 and 1930. But the latter date, the city's population stood at 65,276. Halted by the Depression, this growth again picked up during World War II. Newton reached its peak population in 1960, with a total of 92,384, having more than doubled since 1915. The influence of the Massachusetts Pike extension, with its construction, erased substantial portions of the historic village centers of Auburndale, West Newton, Newtonville and Newton Corner. Newton Massachusetts Multiple Resource Area, nomination document, 1986, National Park Service, National Register of Historic Places, Washington, D.C.